On Monday I had a day of startitis and cast on 3 new projects. What with having a couple of finishes over the weekend I thought I needed new projects to start lol, here’s a look. Okay starting in the top left we have what will become a beanie for James for his birthday, it’s in a dark charcoal. Name of project to be decided. Top right is what I’m calling Copper Pot Milo, it’s a milo vest for Elizabeth for the Autumn. Bottom right are a pair of anklet socks for Elizabeth. I’m calling these Fruit Salad after those sweets I used to get as a child, do you remember those ? Bottom left are a pair of socks for Benjamin. These are going to be the same as the ones I just cast off for Ruairí but in a different colourway. Name again to be decided. I am still reading Friendship Bread. I’ve not gotten in much reading of late, I’ve been to busy outside in the garden. 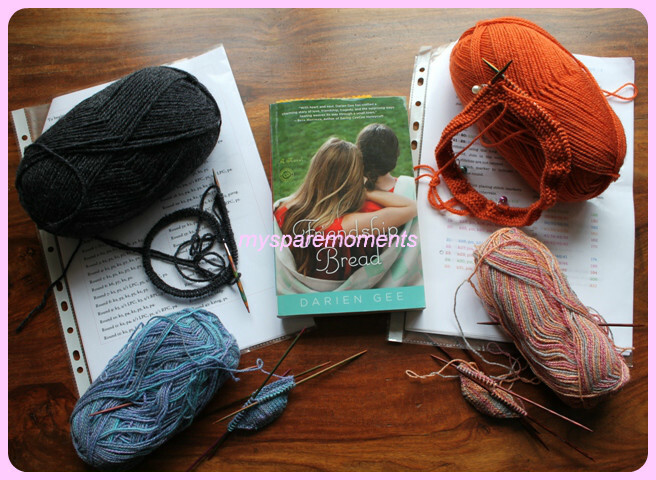 This entry was posted in Books, Crochet, Knitting, Work in progress and tagged Beanie, Ginny, Milo Vest, Reading, Sock, Tami. Bookmark the permalink. That’s startitis alright! I often run into trouble if I make more than one pair of socks at a time because I never write down my mods and then I can’t keep them straight 🙂 Lovely variety of colours and yarns you’ve got going on! Oh, yes…..I love starting projects and look at you go! I need to order more needles so I can start more! LOL! I haven’t gotten much reading in either as I’m too tired at night….all that fresh air sure makes you sleep well! Enjoy the outdoors….it’s starting to get hot here so pretty soon it will be indoors with the AC…..knitting, hopefully! I love the charcoal yarn for the beanie. I was looking at some the other day for my so ns for Christmas for hats. The fruit salad is really pretty and I would love a pair of socks in that blue colorway. Miss Evelyn will look so darling in the copper milo vest too! Great yarn choices! I especially like that fruit salad one for your daughter’s socks. Lots of nice projects – I bet your kids love that you make things for them! 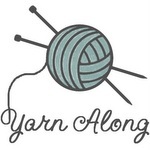 Lovely yarns for your many projects. I remember fruit salad sweets! Love all your new starts Ruth. Wow, four projects started, that’s good going! I am still ploughing on with my shawl, finding very little time to knit. I can’t believe all the projects on your YOP post, well done! I meant to ask when you put up your list what the clock was, I look forward to seeing it! Love the pic of your littlie with sunnies on, brilliant! Your leprechaun is looking great, I think I must be using too smaller needles, as my lace work is no where near clear as yours, I think I will change up when I get to the next section….it’s definitely a big learning process for me, especially beading, lots of sweating and holding breath, my hubby thinks it’s all a little too stressful to be classed a hobby! The clock is done and will be revealed on Sunday, it’s pretty fab looking or at least I think so lol. I’m in the middle of casting off Leprechaun at the moment. I didn’t use beads but will be on the next as I’ve a specific idea of what I want Leprechaun for. I used a 4 at the start then up to a 4.5 then a 5 and last row and cast off is being done in a 5.5. When you block your shawl though the lace will open up. I suppose the bigger needles just give you a more open look. 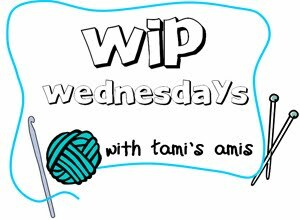 Can’t wait to see what yours looks like, I think the yarn you’ve chosen is just gorgeous ! Hi Ruth, Sorry i have not got back to you sooner. Thank you so much for your kind comment. Still trying to navigate around my new blog and getting to know things. I have tried putting my email add, in your subscribe box but it dose not seem to accept it so bare with me and i hope you get this message ok.